Civilians John Heid, Jean Boucher and Dennis DuVall converse with military police. Photo by Bob Carney. They were stopped at the gate by military police who repeatedly asked the men to turn around and leave. When each of them declined, Tucson police were summoned. Duvall, Heid, and Boucher were arrested, taken into custody, and later released on their own recognizance from the Pima County Jail. They have March court dates. Their full statement and DuVall’s letter appear below. http://www.bandepleteduranium.org/en/a/364.html On December 8, 2010, 148 nations supported a United Nations General Assembly resolution calling on state users of depleted uranium weapons to reveal where the weapons have been fired when asked to do so by affected countries. The resolution was passed by a huge majority, with just four countries opposing the text. As with previous U.N. resolutions in 2007 and 2008, the U.K., U.S., Israel and France voted against. The ultimate weakness of violence is that it is a descending spiral, begetting the very thing it seeks to destroy· returning violence for violence multiplies violence, adding deeper darkness to a night already devoid of stars. Darkness cannot drive out darkness; only light can do that. Hate cannot drive out hate; only love can do that. An entire generation has grown up under the deep darkness of war. Across two decades thousands of U.S. and U.N. soldiers have been killed. Tens of thousands of Iraqi civilians. The wounded are innumerable. The cost immeasurable. The end nowhere in sight. 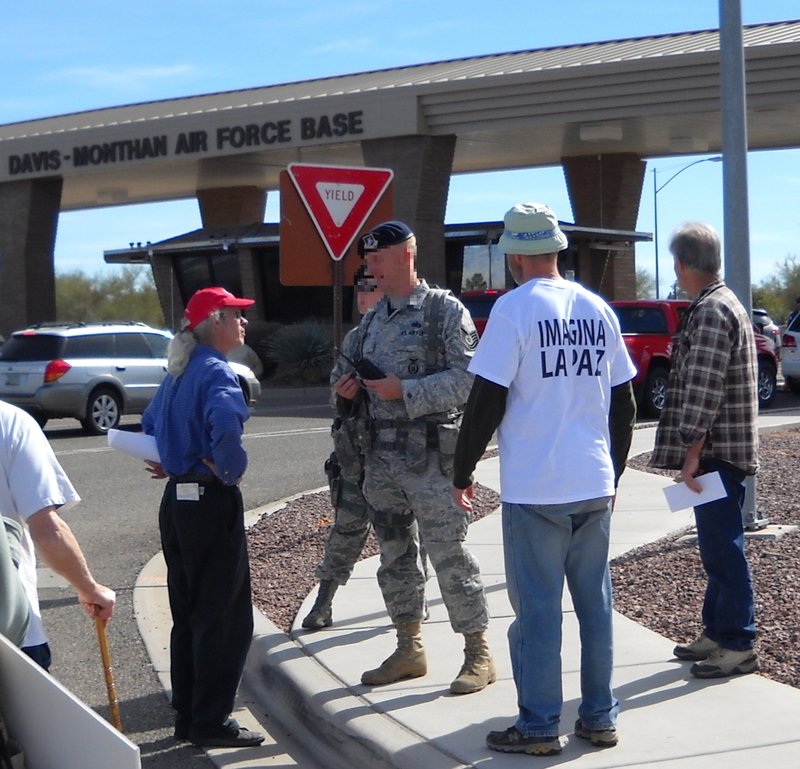 Davis-Monthan has played a central role in the use of depleted uranium weapons in Iraq. Today we call upon General William M. Fraser III, Air Combat Command Leadership and Colonel John A. Cherry to comply with the recent United Nations mandate to reveal the sites where the U.S. has fired depleted uranium shells in Iraq. Today we redouble our twenty year long call for an end to the war. Disarm and disclose! With a spirit of nonviolence, we carry the U.N. resolution along with our own resolve in seeking the ways of peace to Davis-Monthan, at once both symbol and substance of our nation’s commitment to the use of armed force, spending the hopes of our children. And Iraq’s. One step at a time we can usher in the light, ending this decades long darkness devoid of stars. At a time when Tucson is mourning senseless violence in its own community, we must also mourn the victims of the U. S drone attacks 7,000 miles away. Tucson’s complicity in the drone air war is another Tucson tragedy. The tragedy is that Arizona Air National Guard’s 214th Predator Unit here at Davis-Monthan AFB is helping to murder hundreds of innocent people by remote control in Iraq, Afghanistan and Pakistan. By guiding “Hellfire” missiles to their targets in homes and villages, ANG’s Predator Unit will typically kill 10-50 innocent people for each targeted victim. Even more tragically for the people of Arizona and aircrews of the 214th Predator Unit, intentional targeted killing is a war crime! No U. S. court has ever ruled on the legality of “targeted assassinations’ by drones. Col. Inman, I urge you to end the military operations for the 214th Predator Unit and stop bombing the people of Iraq, Afghanistan and Pakistan. Blowing people apart with Hellfire missiles only unites people in outrage and incites more revenge, violence and retaliation. Drone air attack do not prevent or eliminate terrorism. They are terrorism! I implore you to ground the 214th Predator Unit and use diplomacy and other nonviolent means for opposing terrorism. As a veteran, and in the spirit of Martin Luther King, I would welcome the opportunity to enter into a dialog with you and your aircrews. As President Obama said in Tucson just a few days ago, “Only an honest discourse and debate” can honor those who die in senseless acts of violence.